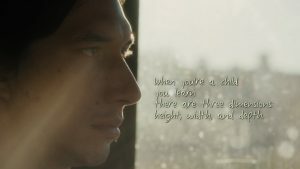 This poem is one of four that American poet Ron Padgett wrote specifically for the new Jim Jarmusch film “Paterson,” which follows a poetry-writing bus driver (played by Adam Driver) who shares a name with his city of Paterson, New Jersey. Throughout the film, we both see and hear Paterson recite his poetry, inspired by his daily routine. Padgett, known for this kind of plain, observational writing, said young people too often have a narrow or inflated view of what poetry has to look like. For Padgett, poetry can simply come, as it does in the film, from the familiar — or the imagined. “Maybe a film like Paterson will help some people say, huh, maybe I could write something like this too,” Padgett said. Watch PBS NewsHour arts correspondent Jeffrey Brown’s interview with Padgett and Jarmusch below.